Dividend, unlike interest, is not a firm commitment. Companies only pay dividends when they make profits and are not allowed to pay dividends out of capital. Here is how you can go about investing in high dividend yield stocks. One of the popular approaches to investing is the dividend yield investment approach. In this method, the investor buys a stock based on the dividend yield of the stock. Thus, if the company is quoting in the market at Rs150 and has paid out full year dividends of Rs3 per share, the dividend yield works out to be 2%. Dividend yield investing is more for conservative investors because you get a virtual assured return on these stocks with very favourable tax treatment. Dividends are tax-free in the hands of the investor if the total dividend per year is less than Rs10lakh. This is in contrast to the interest on bonds and FDs. which are taxed at your peak rate of tax applicable. However, there is a challenge here. Dividend, unlike interest, is not a firm commitment. Companies only pay dividends when they make profits and are not allowed to pay dividends out of capital. Here is how you can go about investing in high dividend yield stocks. In India, oil companies have been paying out high dividend yields for a long time. However, the problem came when crude oil prices went up globally and the downstream companies like HPCL and BPCL were forced to share a part of the price burden. Suddenly, their profits vanished, and these companies stopped paying out dividends. Hence, while buying a high dividend yield stock, first, ensure that the company consistently generates cash flows without too much of cyclicality. This is where companies in the steel sector get hit because their cash flows are too cyclical depending on the metal prices. A company with consistent cash flows paying out higher dividends is a lot valuable to you. If you look at stocks in the FMCG or the IT sector, the dividend yield normally tends to be low and the earnings growth expectations are too high. It is hard for sectors and companies that have set high earnings growth standards to consistently pay high dividends. This is because these stocks tend to focus more on meeting their earnings expectations rather than meeting dividend expectations. Hence, it makes sense to focus on companies where dividend expectations are low, because value creation has normally been associated with companies that pay less dividends and instead plough back profits for growth. 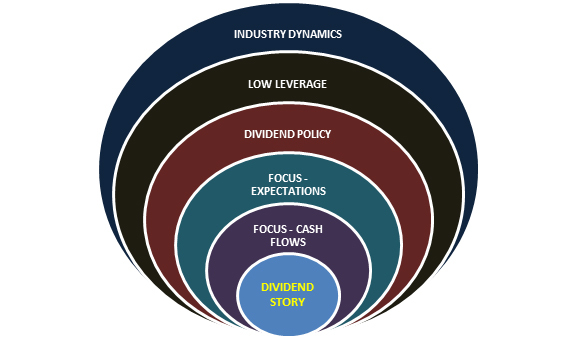 What do we understand by dividend payout policy? Large companies the world over follow a clear dividend payout policy that is benchmarked to a certain dividend yield. As the price of the stock goes up, the rupee dividends are also increased proportionately to maintain the dividend yield. This works in your favour because as the stock price goes up and the rupee dividends go up, you stand to benefit from a higher dividend yield on your investments. A classic example is that of companies like Wipro and Infosys which have kept dividend yields low but have consistently increased it in rupee terms to benefit long-term investors. This is where a long-term dividend policy by the company comes in handy. Even if the company has a high dividend yield to begin with, be cautious on high-debt names as they can lead to financial risk at a later stage due to leverage. Take the case of stocks like GVK and GMR. They did look attractive in the early days when they were making profits. Eventually, the high debt came back to haunt them and for the last many years, they have not been in a position to pay out dividends. As a matter of strategy, you must focus on companies with low levels of debt. When the company is not able to service its debt, there is no way it can service equities. When you invest in a stock for the sake of dividends, the industry cycle matters a lot. Let us look at some unique industry-level eccentricities. A power utility cannot increase its dividend yield beyond a point as pressure would then build up to reduce power tariffs for consumers. Same is the case with a telecom company where consumer pressure can be quite high. Companies like steel and upstream oil can be quite cyclical as their profits and revenues are largely dependent on commodity prices. When it comes to banking, most PSU banks had very attractive dividend yields a couple of years ago, however, NPAs are now haunting the sector.